For insight into how test compounds interact in the human joint, an in vitro model combining synoviofibroblast (FLS) cells and cartilage explants has been developed by Pretzel, etal (1). Articular Engineering can provide ready-to-use co-culture testing plates. Tissue Procurement: Human cartilage and synovial tissue is collected from cadaveric donors within 48 hours of death or as surgical specimens from a relevant procedure. The tissue is harvested from the knee joint from both clinically “healthy, normal” donors and from those diagnosed with rheumatoid and osteoarthritis. Proper consent and serological information is obtained on all specimens. 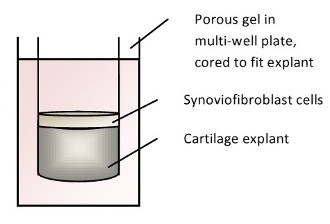 Co-culture Processing: Cartilage explants from a normal, healthy donor are press fit into gel coated wells of a 48-well plate with the superficial, outer layer of tissue oriented towards the top. Synoviocytes from either normal, OA+ or RA+ donors are recovered from cryopreservation and seeded on top of the explant. The culture is maintained in a humidified incubator at 37oC and 5% CO2 for a minimum of 48 hours to promote cell adhesion and then shipped with cold packs for overnight delivery. Wet Weight Determination: If desired, the wet weight for each explant can be determined. The explant is blotted and weighed using an analytical balance. Wet weights are reported in milligrams in an Excel spreadsheet. Wet weights can be used to normalize data during culture analysis. Histology Service: A cartilage-synoviocyte explant will be formalin-fixed, paraffin embedded and sectioned into slices 5 microns thick. Two unstained slides and one stained with H&E will be provided. Please note the synoviocyte layer may become detached during processing. Additional shipping required. (1) Pretzel D, Pohlers D, Weinert S, Kinne RW. In vitro model for the analysis of synovial fibroblast-mediated degradation of intact cartilage. Arthritis Research & Therapy. 2009.